This cheeky little dinosaur just loves playing in the dirty swamp. He gets mud all over his body as he sniffs, stomps, splashes and slides in the mud. Will he ever have a bath? 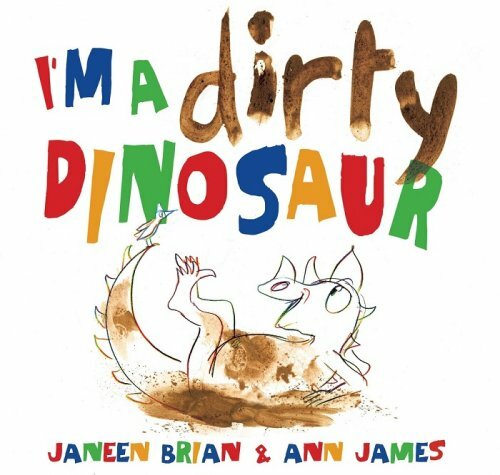 I’m a Dirty Dinosaur will get little ones moving as they join in with the singsong rhymes and copy the dinosaur’s actions. This engaging book could be used as a prelude to bath time to encourage children to dive right in and wash wash wash just like the little dinosaur. The repetitive language makes it an ideal choice for developing children’s communication skills, particularly their labelling of body parts, use of action verbs, and personal pronoun ‘I’. For further speech and language targets in I’m a Dirty Dinosaur, see the list below.